Participants agreed that to meet global requirements, domestic enterprises should identify core business areas and apply high and safe technologies to grow sustainably. They also emphasized the vital role of boosting start-ups and setting development directions for each type of businesses where a start-up isn’t needed to encourage the establishment of new companies but the restructuring of products, services, management, and technology upgrading. 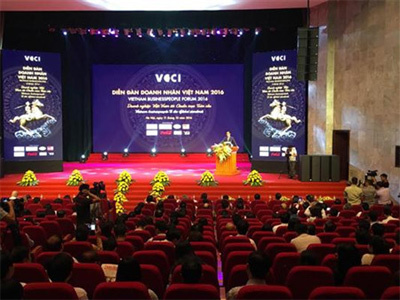 Vu Tien Loc, Chairman of the Vietnam Chamber of Commerce and Industry, said the government was trying to improve Vietnam’s competitive ranking in ASEAN and the world. To this end, the domestic business community should improve itself, make breakthroughs, and adapt to new business conditions, according to Loc. “We are facing a great challenge – a wave of globalization. The 12th Party Congress set the goal of improving the market economy to match global standards. The government has been resolutely building an incorruptible government and speeding up reforms. This is a good chance for the Vietnamese business community, especially young people, to make change and advance forward,” said Loc. Delegates to the forum discussed solutions for increasing competitiveness in M&A and business development in combination with the national green growth strategy./.